Dotonbori has been called the heart of Osaka. It is Osaka’s most famous tourist attraction, known for its bright and extravagant neon lights, which pierce the night and reflect off the surface of the Dotonbori Canal. This “bright heart” of Osaka is a colorful must-see anytime you travel through Japan’s Kansai region. Dotonbori is also renowned for its variety of bars and restaurants. 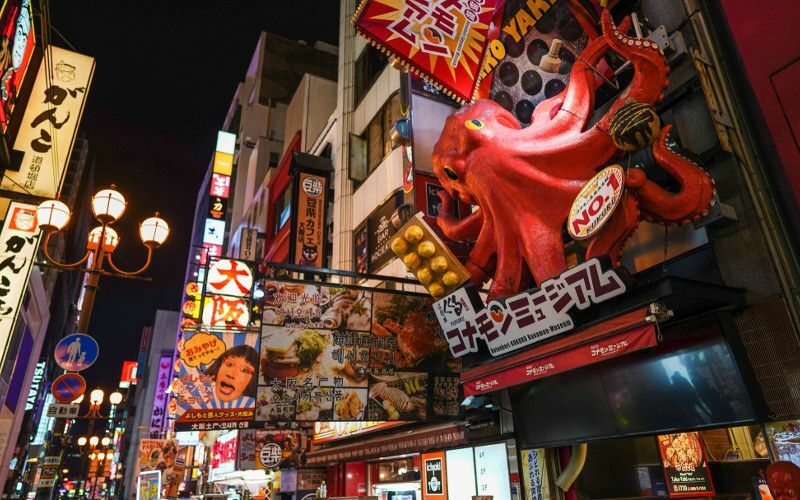 Is the Dotonbori nightlife calling to you? 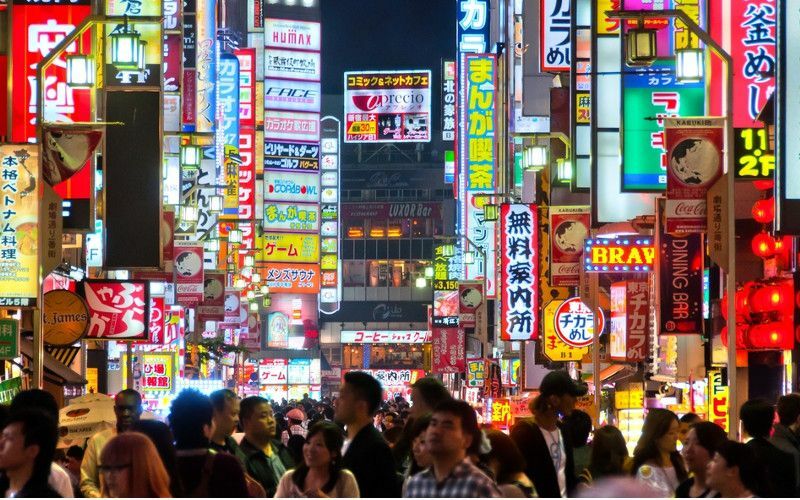 Check out this handy travel guide to learn all you need to know for your next trip to Dotonbori. The term “Dotonbori” is twofold – it refers both to the Dotonbori Canal and to the Dotonbori Street, which runs parallel to the south bank of the canal. Dotonbori spans from the Dotonboribashi Bridge to the Nipponbashi Bridge. By day, Dotonbori is an entertainment and shopping street. As a night market, the neon lights will make you feel as if the city never sleeps. Using your Japan Rail Pass, travel to the JR Namba Station (Yamatoji line). Dotonbori is about a five-minute walk from the station. Using your JR Pass you can reach JR Namba Station from Shin-Osaka Station through Tokaido-Sanyo line to Osaka Station. Once there, take the Osaka Loop line to Imamiya Station, and then just one stop to JR Namba by the Yamatoji Line. This trip wil take you about 35 minutes. Also, you can reach Dotonbori from Shin-Osaka using the Osaka’s Subway Midosuji line to Namba Station (Osaka’s Subway) in about 20 minutes. If you want to go from Dotonbori to the Kansai International Airport, you can take, from JR Namba Station the JR Yamatoji Line to Tennoji Station, and there take a Haruka Express along the Hanwa Line direct to KIX. The full traject wil take you about 1h. If you find you need a rest from your travels, the Capsule Hotel Astil Dotonbori has you covered. Located right on Dotonbori Street, your capsule sleeping quarters come with amenities such as a snack, television, internet, pajamas, slippers, toiletries, and more. Dotonbori enjoys a long and rich history. In 1612, the merchant Yasui Doton invested his life savings in a project to divert the Umezu River into a canal system that would link the Umezu to the Kizugawa River. Doton never got to complete his project, however. Work on the canal system was halted by war, and Doton was killed in the Siege of Osaka in 1615. Within a year, Doton’s cousins completed the canal and named it in honor of their fallen relative – Dotonbori, meaning “Doton Canal”. After the canal was completed, this new means of transportation caused the area to flourish. Trade increased, and by 1626, Dotonbori had become known as an entertainment district, complete with theaters and playhouses on its southern bank. In its prime, Dotonbori hosted six Kabuki theaters, five Bunraku theaters, and the Takeda Karakuri mechanical puppet theater. The canal’s north side became home to restaurants and teahouses. The groundwork was thus laid for the Dotonbori we know today. The canal itself offers a host of activities. You can stroll along the pedestrian walkways that skirt its banks to enjoy the flash of the neon lights. Or, you can take a boat cruise on the canal itself. 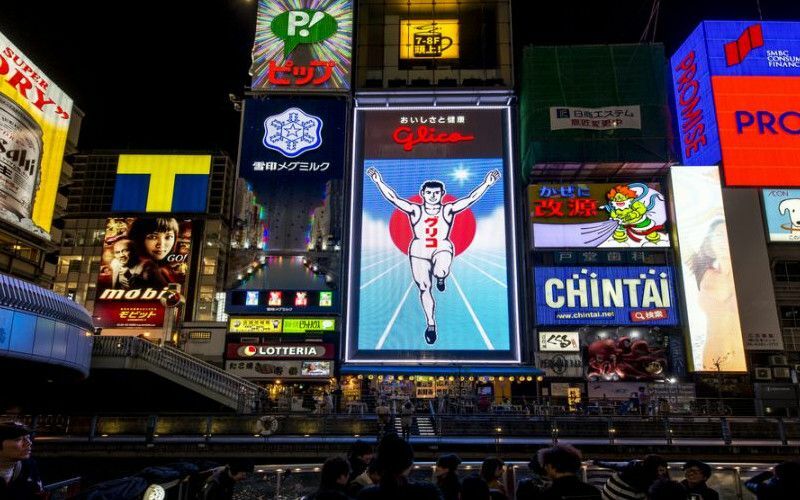 Look for iconic neon signs, such as the famous “running man” sign of the Glico confectionary company. This famous sign has been a Dotonbori staple since 1935. Other landmarks include the Kuidaore Taro – a mechanical drum-playing clown – and the Kani Doraku mechanical crab. The Shochikuza is one of Dotonbori’s few remaining theaters – bombing during World War II destroyed many of its competitors. The Shochikuza features classic kabuki plays, operas, and modern works, such as dramas and musicals. A number of small comedy clubs are also located in the area. The Konamom Museum immortalizes one of Osaka’s signature foods, the takoyaki octopus ball. You can both eat takoyaki and create a souvenir wax replica. Also check out Don Quijote Dotonbori, a store that sells a bit of everything at discount prices. The store is recognizable by its large yellow Ferris wheel. Ebisubashi bridge, located under the Glico running man billboard, is a popular meeting spot. 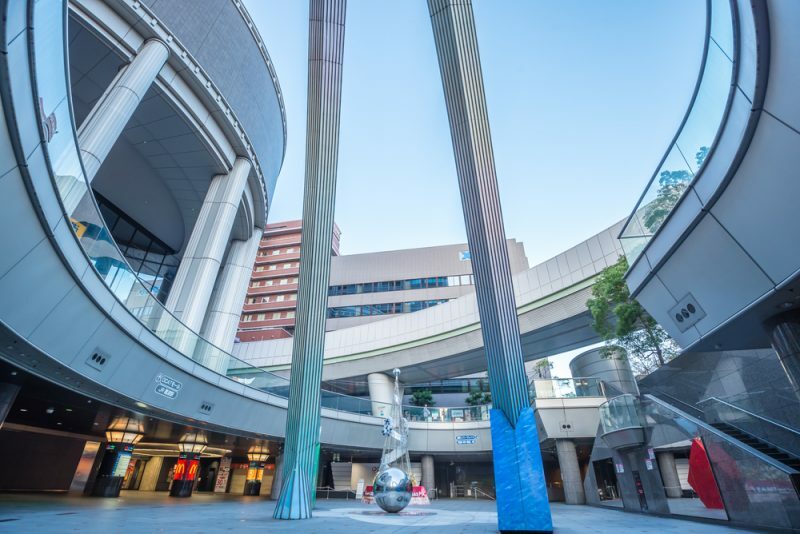 It provides access to Ebisu Shrine as well as the Shinsaibashi-suji and Ebisubashi-suji shopping districts. Foodies sum up Dotonbori’s obsessive food culture in one word – kuidaore, which means “eat till you drop” or “spend so much on food that you fall into financial ruin.” Food lovers adore the rich variety that Dotonbori has to offer. Some kuidaore fan favorites include Hariju, a proprietor of Japanese beef since 1948; Zubora-ya, specializing in the risky pufferfish dish, fugu; Kushikatsu Daruma, a favorite kebab shop since 1929; Kinryu Ramen, with three locations along the boardwalk; and Kukura, which features octopus dumplings. You’ll also find ample street food of all types and flavors. The Dotonbori food district is also known for its famous signage. The Kani Douraku crab restaurant is famously advertised by a giant crab on the building’s storefront, complete with lifelike motion. Kani Douraku is so popular that wait times may be as long as three hours; advance reservations are recommended. Are you hungry for a bit of adventure? Then Dotonbori is the place to go. 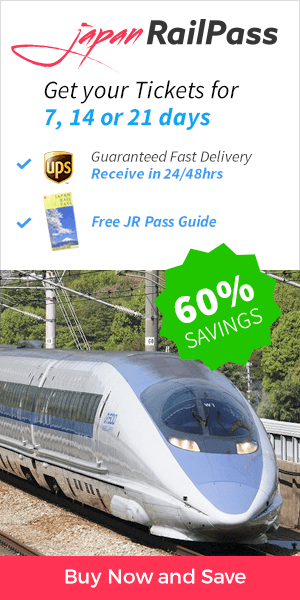 Book your JR Pass, and start planning your next trip today.